What a great combination! 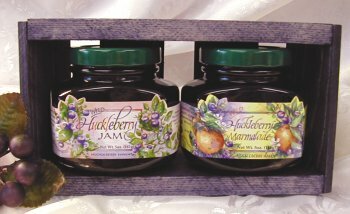 This hand crafted custom crate includes one 5oz jar of Wild Huckleberry Jam & one 5oz jar of Wild Huckleberry Marmalade. Who's on your gift list this year? Hand crafted custom crate makes a perfect gift for any jam lover. Beautiful gourmet labeling with a delectable wild berry kick & a zest of orange. Just the perfect size! Enjoy them on your next picnic or camping trip. Need a hostess gift? Think Wild Huckleberry Products! If you have any questions about this product by Taste the Wilderness, contact us by completing and submitting the form below. If you are looking for a specif part number, please include it with your message.